Getting lost in Venice is a good thing! It was late at night when I arrived near Venice. I had arrived a day early, so I stopped right in front of the bridge to the island, and from the parking lot I had a wonderful view over the city. I couldn’t wait to go and visit it! That night I went to sleep feeling excited and happy: it was not going to be my first time ever in Venice, but the idea of going back to that wonderful place made me smile all night. 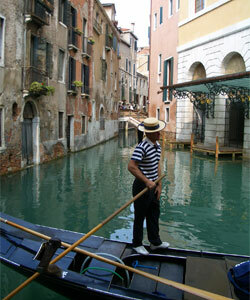 I’m going back to Venice! 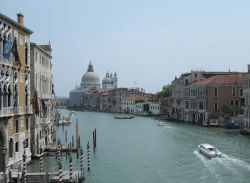 Yes, we all know, Venice is absolutely amazing, and during my one week language course there I almost couldn’t believe it was for real. 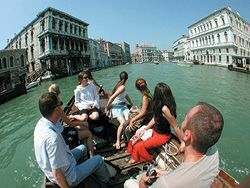 There are some clichés about Venice that I will try to avoid, mainly because they are true – it is one of the most beautiful cities in the world and therefore there are also an abundant number of tourists, some places can also be quite pricey. But at the end of your experience in Venice that won’t be what you keep in mind, especially if you try to move away from the crowds. It is surprisingly easy to find yourself in a peaceful street where you can actually experience the Venetian way of life (and practise your Italian language skills)! Exploring a bit further than the Grand Canal also gives you a nice perception of Venice; islands like Giudecca, Murano or Lido are only a boat trip away and aren’t usually so packed. Venice is incredible! My first words of advice to anyone going there – don’t read too many guidebooks and don’t listen to too many people who have already been there. Before I arrived I had heard warnings of how expensive everything would be, how many tourists I would find, that the water is smells in summer, you need to take a boat to get anywhere… blah blah blah. Go to Venice with an open mind and you won’t notice any of these things because you are simply too distracted by how AMAZING the place is!